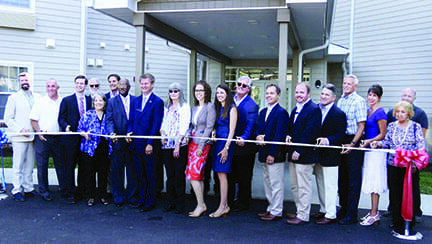 KNOXVILLE, TN — Recently, Knoxville Mayor Madeline Rogero, Knox County Mayor Tim Burchett and community members gathered with Knoxville’s Community Development Corporation (KCDC) and Tennessee Housing Development Agency (THDA) officials to celebrate the opening of The Residences at Five Points, a three-story, 90-unit affordable housing complex for seniors and people with disabilities. Located at 2061 Bethel Ave., the new, energy-efficient complex features 84 one-bedroom units and six two-bedroom units. It includes two elevators, laundry facilities and community spaces, such as a meeting room with computer stations. The site also offers green space with a picnic pavilion. The Five Points Master Plan guides the design and features of all four phases of the neighborhood’s revitalization. Led by Johnson Architecture, the process included input from residents of the Walter P. Taylor and the Lee Williams developments, along with other community members and stakeholders, to determine how to address community needs and concerns during the $10 million redevelopment. The Residences at Five Points was funded primarily through low-income housing tax credits from THDA. Additionally, the City of Knoxville has committed $800,000 annually for 10 years to the total Master Plan project for infrastructure improvements. The city included an additional $1.55 million in its 2018 annual budget. Since 2010, KCDC and the City of Knoxville have invested more than $21 million to replace outdated housing units by building 122 units of affordable housing, which includes the adaptive reuse of the Eastport School as The Residences at Eastport for senior housing. Another forward-looking aspect of the new development is KCDC’s use of the rental assistance demonstration (RAD) program, created by the U.S. Department of Housing and Urban Development (HUD) in 2012 to help agencies continue their housing mission without depending on federal funds. The program allows public housing agencies to leverage public and private debt and equity to reinvest in public housing stock. Burchett also spoke in support of the revitalization project. “Knox County is proud of everyone involved in this project, and we’re excited to see improvements made to Five Points during this development,” he said. Work on implementing the Master Plan continues. In May, KCDC broke ground on Five Points Phase 2, a $13 million, 84-unit affordable housing complex to be built at the corner of Martin Luther King Jr. Avenue and McConnell Street. For more information, call 865-403-1100 or visit https://www.kcdc.org.